The C13 Breath test is a radiation-free test used for the detection of Helicobacter pylori (H. pylori). The test is a non-invasive, fast and highly accurate test and most importantly does not contain any radioactive material which is found in the widely used C14 breath test. H. pylori is a bacteria that can be commonly found living in the stomach, usually without causing any symptoms. However, over time this bacteria causes severe damage to the stomach, causing ulcers and stomach cancer. H. pylori is recognised by the World Health Organisation as a Class 1 carcinogen. H. pylori in the stomach produces urease, an enzyme that can break down a naturally occurring nitrogen-rich compound called urea. We administer a special form of urea, tagged with a heavier-than-usual form of carbon, called C13. If the urea is broken down by H. pylori, we can identify C13 in your breath. The C13 breath test is so sensitive that it is also used to demonstrate whether H. pylori has been successfully eliminated by treatment with antibiotics. The C13 breath test involves drinking a liquid that has had a non-radioactive powder dissolved in it. 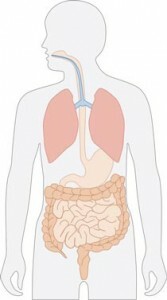 A simple, safe and non-invasive breath test can then detect if H. pylori is evident. The test takes approximately 15 minutes. The C13 breath test is the only H. pylori breath test that is safe for children, women of child-bearing age and pregnant women. The C13 Urea Breath test will be bulk billed for all patients holding a valid Medicare card. For private patients the cost will be $99.00. To enable the cost of your test to be bulk billed you will require a referral from your General Practitioner or specialist. It is essential for the accuracy of the test that the following pre-test preparations be adhered to. Discontinue sucralfate and any PPI’s – Losec®, Somac®, Zoton®, Nexium® and Pariet® (please consult with your GP before discontinuing any prescribed medications). You may take Zantac® (available over the counter) for any troublesome symptoms until 24 hours before the test.